Death Toll In Kabul Blast Surpasses 150, Afghan President Says : The Two-Way Previous estimates said 90 had died in last week's truck bombing outside the German Embassy. Speaking at a Kabul peace conference, Afghan President Ashraf Ghani did not explain the sharp increase. The death toll from Wednesday's bomb attack in Kabul has risen to more than 150, according to Afghan President Ashraf Ghani. He spoke at an international peace conference Tuesday in the Afghan capital. Afghan President Ashraf Ghani said Tuesday that more than 150 people died in last week's truck bombing in Kabul, raising earlier counts and making it one of the deadliest such attacks since the American-led invasion toppled the Taliban in 2001. "Over 150 entirely innocent Afghan sons and daughters were killed and more than three hundred were brought to hospital with burns, lacerations, and amputations," Afghan news site TOLOnews quoted Ghani as saying. Previous estimates had put the number of dead at 90. The president did not explain the sharp increase. The bombing took place during Wednesday morning's rush hour, when a truck exploded in the diplomatic zone of central Kabul. The streets were packed with commuters as well as children heading to school. The blast shattered windows at the presidential palace, while Ghani was inside, The New York Times reports. In his remarks, Ghani praised the work of 13 Afghan police officers who died in the blast, saying that thanks to them, "nobody from the diplomatic community was killed." 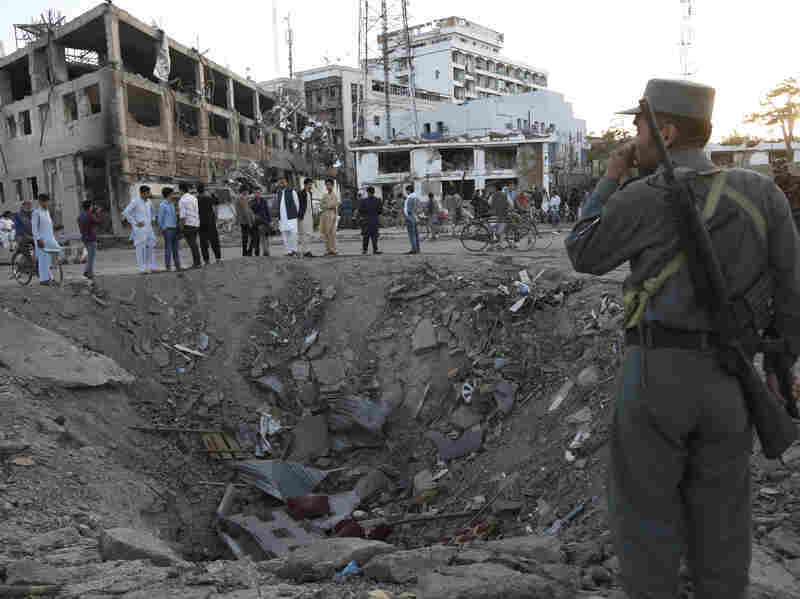 Security forces stand next to a crater created by a massive explosion in front of the German Embassy in Kabul on Wednesday. Ghani was addressing representatives from about two dozen countries and international organizations at a one-day peace conference called the Kabul Process. While he spoke, demonstrations continued outside on the streets of Kabul. As The Two-Way has reported, the explosion prompted protests and calls for Ghani and other top government officials to step down over the security lapse. The protests themselves turned deadly Friday when security forces opened fire on demonstrators, killing several. Nearly a week after the explosion, no group has claimed to have carried out the attack. And while the Taliban have specifically denied responsibility, Afghanistan's intelligence service believes the Haqqani network, a Taliban-affiliated group in Pakistan, carried out the attack, CNN reports. "Taliban sponsored terrorism is creating a platform that is bringing terrorists and criminals from all over the region to Afghanistan," Ghani said, according to his prepared remarks. He called for peace talks with the group. But a Taliban spokesman told The Times that talks are pointless while foreign troops remain in the country. While Ghani said he would not be drawn "into a blame game," he did call out Pakistan, saying that despite attempts at negotiations to bring an end to conflict and terror, "we have made little progress." Ghani added that Afghanistan's other Asian neighbors must also play a role. "In the past there has been a misperception that this was 'America's War,' " he said. "By now that illusion should be finished." The United States officially withdrew from Afghanistan in 2014, but it maintains a presence of about 8,400 troops there. The Trump administration has been mulling calls to add more military personnel amid continued insurgent attacks. 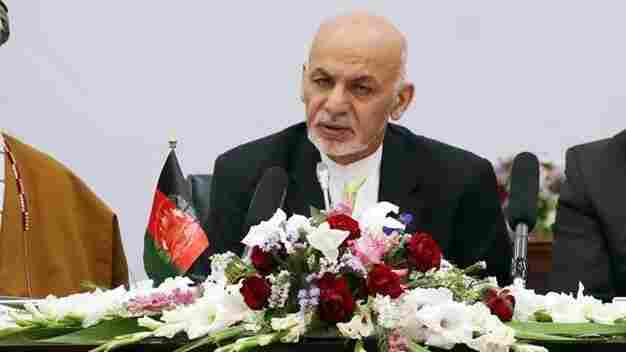 Ghani appealed to the international community to end "global terror" and cited the May 22 attack at Manchester Arena in England that left at least 22 people dead. ISIS claimed responsibility. "As [British] Prime Minister [Theresa] May recently said, 'Enough is enough,' " Ghani said. "And today we are demanding that the world make good on this promise. The violence must be stopped."